In 2013, NFU Mutual reported that rural theft cost the UK £44.5m. * That’s a staggering number, especially when those thefts are often of key assets that farms rely upon. By making farm security a priority you can feel reassured that the livestock, machinery and equipment you need are kept safe. You won’t experience down time on your farm, with business critical equipment and more protected and secure. 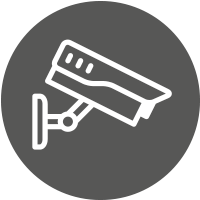 With remote monitoring services from Farsight your farm security and farm CCTV will be optimised. Giving you complete peace of mind. What is remote monitoring and how can it improve farm security? Remote monitoring is when security professionals monitor activity at your site when you need it most – that can be 24/7, overnight or during any other time period. The security professionals, also known as operators, will be monitoring alarms coming from your site’s CCTV, intruder, fire and/or access control systems. From there, if they identify suspicious activity on your site they can notify yourself (if you want), keyholders and the relevant emergency services. Your farm will be monitored by highly trained security professionals. Intruders will be warned away from your site with live audio announcements. Your insurance premiums could improve. Farm work can continue uninterrupted by criminal activity including theft and vandalism. With remotely monitored farm CCTV incidents will be visually verified, ensuring a rapid emergency response. By choosing Farsight Security Services your farm’s security will benefit even more with the accredited remote monitoring station’s rapid response times, industry-leading standards and experience in monitoring agricultural sites. Remote monitoring can also improve the efficiency of your farm. With remote systems control you can also monitor water levels in troughs, temperatures in livestock sheds and be alerted to power failures. With remote monitoring in place you can always feel reassured that your farm is not only safe and secure, but also running as efficiently as possible. Get in touch with Farsight today to find out how we could improve your farm’s security and more. Call us on 0845 371 0101 or send us an email. Get in touch with us today to find out how Farsight Security Services could improve your farm’s security. Phone us on 0845 371 0101 or send us an email.